Simple and Delicious for the holidays or any day! Line 2 baking sheets with parchment paper. Set aside. Mix cereal and marshmallows in large bowl. Set aside. Melt white chocolate and peanut butter together. I used the microwave. Check frequently and stir. Don’t over heat it though. (If you overheat it will become hard and crumbly.) You can also use the double boiler method. Place in refrigerator until set. About 1 hour. Thought I would bake some different cookies for the Holiday Season. I found this recipe in my Betty Crocker cookbook. I made some as sandwich cookies and the rest as a cookie with or without ganache topping. Give these a try! I am going to use this recipe with lemon and thyme over the weekend. Hmmm, maybe lavender and lemon! What do you think of that? Bake 6 to 8 minutes or just until edges start to brown. Remove from cookie sheets to cooling racks; cool completely. Meanwhile, in small microwavable bowl, microwave chocolate chips and whipping cream uncovered on High in 15-second intervals until chips can be stirred smooth. Refrigerate until cooled and mixture starts to set, about 10 minutes. 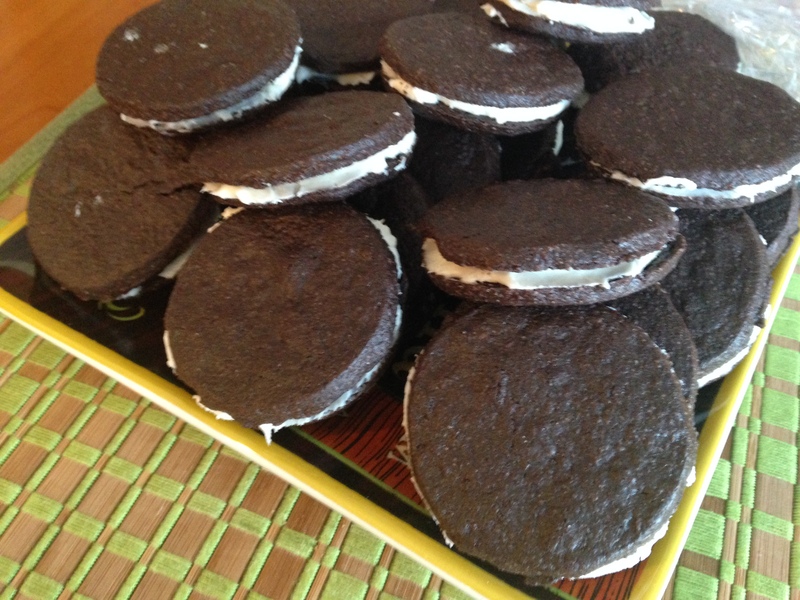 For each sandwich cookie, spread about 1/2 teaspoon filling on bottom of 1 cookie. Press bottom of second cookie over filling. Let stand until set. When they first come out of oven the rosemary is a strong flavor as a warm cookie. At first I thought I would recommend cutting the rosemary quantity in half. As the cookies cool it is just right. The holidays are arriving. Breakfast pizza is great for a crowd or a hungry few. You can prepare the dough, meats and shred your cheese the night before. Wake up and throw it together the next day. For this pizza I use my cast iron or stainless steel skillet. You can do any combination of meats/veggies you want. We generally do sausage and Canadian bacon for the meat combo. Bacon is also a nice touch. 1. Fry bacon until crisp, remove from fry pan with slotted spoon and place on paper towel. 2. Fry sausage until done, also remove from fry pan and place on paper towel. 3. Whisk eggs with 2 Tablespoons milk. 5. Brush dough with softened or melted butter. That is it. You will really enjoy this pizza. Simple and delicious!